Chef’s Star The Chef’s Star juicer easily extracts juice and nutrients from the toughest produce. The wide mouth design allows you to juice most whole fruits & vegetables with ease. The extra large pulp bin allows for much longer continuous juicing. Why buy ready made juice from the store when you can quickly and easily make your own personalized & preservative free juice at home. Your only limit is your imagination, mix and match any fruits, vegetables, or grasses you desire. 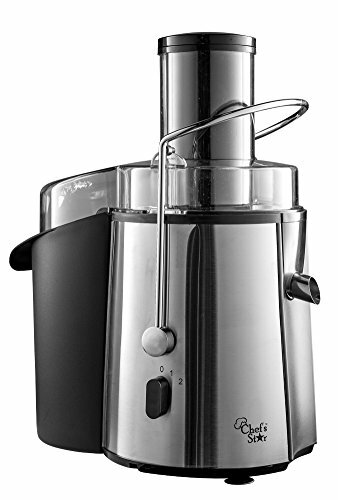 Features Powerful high speed juice extractor, featuring 700-Watt motor Easy to use, assemble, disassemble and clean Extra Large pulp-bin Wide-Mouth design lets you fit whole fruits & vegetables Dishwasher safe What’s in the box Chefs Star Wide Mouth Fruit & Vegetable Juicer.